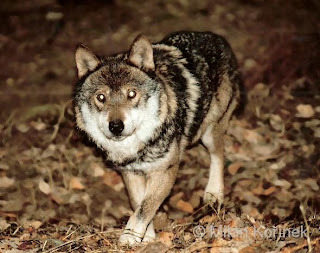 A large, doglike carnivore with heavy, broad skull and muzzle; height at shoulder slightly greater than at rump, imparting a suggestion that the animal is partly crouched; legs relatively long (as compared with a coyote); tail relatively short; upperparts grayish, usually heavily washed with blackish, occasionally predominately blackish; head more or less tinged with cinnamon; underparts whitish or buffy; tail black-tipped. Dental formula as in the coyote. External measurements of a male: total length, 1,626 mm; tail, 419 mm; hind foot, 267 mm; a female, 1,473-360-269. Weight: males, 30-80 kg; females, 20-60 kg. The gray wolf formerly ranged over the western two-thirds of the state, but now is extirpated over all of the west, including Texas. The last authenticated reports of gray wolves in Texas are of two males, the skulls of which were donated to Sul Ross State University. According to James Scuddy, one wolf was shot December 5, 1970, on the Cathedral Mountain Ranch, 27 km south of Alpine, Brewster County. The other was trapped several days before December 28, 1970, on the Joe Neal Brown Ranch located at about the point where Brewster, Pecos, and Terrell counties meet. 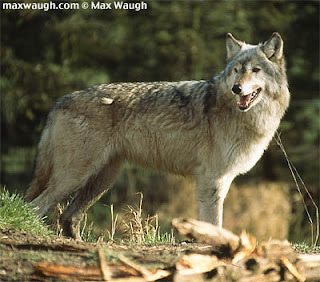 The gray wolf inhabits forests, brushlands, or grasslands, preferring broken, open country in which suitable cover and denning sites are available. Formerly, wolves occurred commonly in the grassland plains of the buffalo on which they relied for their chief food supply. Wolves have marvelous stamina and endurance and can travel for hours without apparent fatigue. They usually travel and hunt in packs, occasionally in pairs or singly, depending on their own endurance or numbers to "wear down" the intended large prey. The family group constitutes the nucleus of the pack, to which bachelor friends or members of another family may be added. The usual pack consists of six to 10 individuals, but packs twice this size are not uncommon. Packs of as many as 50 individuals are rare. Under natural conditions, the food of wolves consists of the larger herbivores — deer and pronghorns. But when such game is scarce they turn their attention to mice, ground squirrels, and rabbits. The young pups normally spend considerable time in stalking and capturing small mice. Where natural foods are scarce and domesticated livestock available, wolves soon learn that such items are satisfactory substitutes. 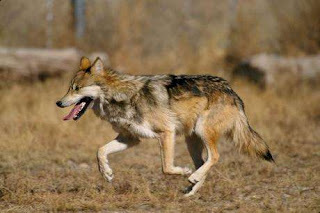 The extirpation of the wolf over most of its former range released predator pressure on such big game as deer, which in part created a serious problem of overpopulation of this game animal in several localities in Texas. 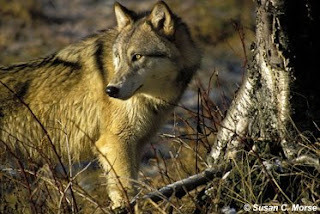 That wolves play a valuable role in the economy of big game animals is frequently overlooked. Wolves mate for life. The young, usually four to six in number, are whelped in late winter or early spring in a den dug into a hillside, cut bank, or in a crevice in a rocky bluff. The breeding season begins in late December and continues through February; the gestation period is about 63 days. At first, the young are blind, naked, and helpless but they grow rapidly. At about 9 days of age their eyes open, at which time they are covered by wooly, juvenile fur. By October they are nearly full-grown. Females are sexually mature when 2 years old; males mature about a year later.